This morning, we want to take a minute and ask you to check out this awesome horse bracelet. So many of you have asked us, over the years, for horse jewelry that is both classy and casual, and this bracelet delivers. Simple and elegant, the Liberty Namecube bracelet combines black leather and sterling silver. Bead charm bracelets are one of the strongest jewelry trends. When you wear your Liberty Namecube bracelet, you’ll be totally on point. 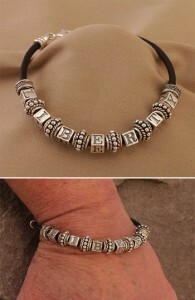 In this great horse bracelet, engravable cube beads alternate with sterling silver rondelles. Spell out the name of your horse, your dog, your stable or anything else that makes you smile. There’s also a tiny horseshoe dangle charm on the bracelet for that perfect equestrian touch. You’ll be surprised how comfortable this bracelet is. It’s an easy to wear piece of fine horse jewelry. You may find yourself wearing it every day. The lobster claw clasp is exceptionally high quality and secure, so you don’t have to worry about losing your bracelet. The bracelet adjusts from 7 1/4″ to 8 1/2″. When you measure your wrist for bracelet size, first wrap the tape snugly just below the wrist bone – the area where you’d wear your watch. Then add 1.25″ to that measurement. Interested in other equestrian bead charms? You’re in luck. If you have a Pandora or Pandora-style bead charm bracelet, we have an exclusive line of equestrian themed charms. You won’t find them any where else! Available in silver and gold, there are over a dozen designs, including horsehead charms, hay bale charms, riding boot charms and more!